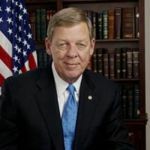 Johnny Isakson, born December 28, 1944 (age 74), is a Republican United States Senator from Georgia. He is a member of six Senate committees that have jurisdiction over education, healthcare, transportation, environment, ports, foreign policy, veterans’ affairs, jobs and small businesses. This page was last modified on 27 June 2016, at 01:14. This page has been accessed 4,315 times.